In early 2004, Martin Fowler asked the readers of his site: when talking about Inversion of Control: “the question is, what aspect of control are [they] inverting?”. Fowler then suggested renaming the principle (or at least giving it a more self-explanatory name), and started to use the term Dependency Injection. His article then continued to explain the ideas underpinning the Inversion of Control (IoC) and Dependency Injection (DI) principle. If you need a decent insight into IoC and DI, please do refer to said article : http://martinfowler.com/articles/injection.html. Java applications (a loose term which runs the gamut from constrained applets to full-fledged n-tier server-side enterprise applications) typically are composed of a number of objects that collaborate with one another to form the application proper. The objects in an application can thus be said to have dependencies between themselves. The Java language and platform provides a wealth of functionality for architecting and building applications, ranging all the way from the very basic building blocks of primitive types and classes (and the means to define new classes), to rich full-featured application servers and web frameworks. One area that is decidedly conspicuous by its absence is any means of taking the basic building blocks and composing them into a coherent whole; this area has typically been left to the purvey of the architects and developers tasked with building an application (or applications). Now to be fair, there are a number of design patterns devoted to the business of composing the various classes and object instances that makeup an all-singing, all-dancing application. Design patterns such as Factory, Abstract Factory, Builder, Decorator, and Service Locator (to name but a few) have widespread recognition and acceptance within the software development industry (presumably that is why these patterns have been formalized as patterns in the first place). This is all very well, but these patterns are just that: best practices given a name, typically together with a description of what the pattern does, where the pattern is typically best applied, the problems that the application of the pattern addresses, and so forth. Notice that the last paragraph used the	phrase “... a description of what the pattern does...”; pattern books and wikis are typically listings of such formalized best practice that you can certainly take away, mull over, and then implement yourself in your application. 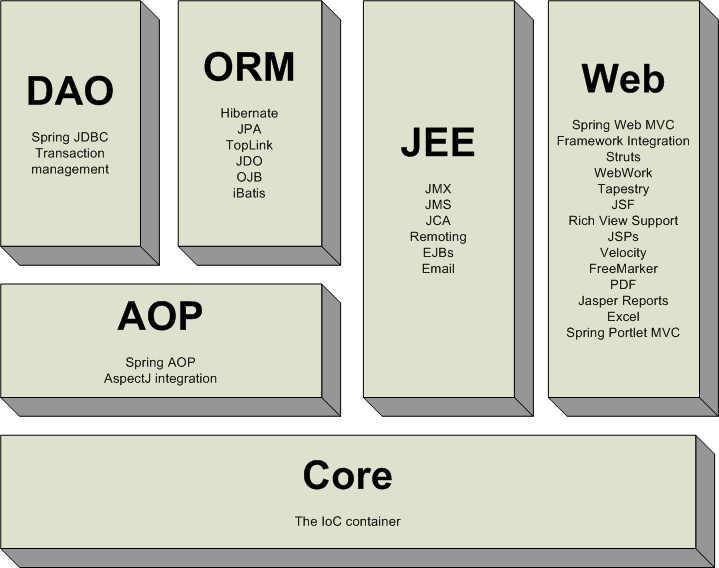 The IoC component of the Spring Framework addresses the enterprise concern of taking the classes, objects, and services that are to compose an application, by providing a formalized means of composing these various disparate components into a fully working application ready for use. The Spring Framework takes best practices that have been proven over the years in numerous applications and formalized as design patterns, and actually codifies these patterns as first class objects that you as an architect and developer can take away and integrate into your own application(s). This is a Very Good Thing Indeed as attested to by the numerous organizations and institutions that have used the Spring Framework to engineer robust, maintainable applications. The Spring Framework contains a lot of features, which are well-organized in seven modules shown in the diagram below. This chapter discusses each of the modules in turn. The Core package is the most fundamental part of the framework and provides the IoC and Dependency Injection features. The basic concept here is the BeanFactory, which provides a sophisticated implementation of the	factory pattern which removes the need for programmatic singletons and allows you to decouple the configuration and specification of dependencies from your actual program logic. The Context package build on the solid base provided by the Core package: it provides a way to access objects in a framework-style manner in a fashion somewhat reminiscent of a JNDI-registry. The context package inherits its features from the beans package and adds support for internationalization (I18N) (using for example resource bundles), event-propagation, resource-loading, and the transparent creation of contexts by, for example, a servlet container. The DAO package provides a JDBC-abstraction layer that removes the need to do tedious JDBC coding and parsing of database-vendor specific error codes. Also, the JDBC package provides a way to do programmatic as well as declarative transaction management, not only for classes implementing special interfaces, but for all your POJOs (plain old Java objects). The ORM package provides integration layers for popular object-relational mapping APIs, including JPA, JDO, Hibernate,	and iBatis. Using the ORM package you can use all those O/R-mappers	in combination with all the other features Spring offers, such as the simple declarative transaction management feature mentioned previously. Spring's AOP package provides an AOP Alliance-compliant aspect-oriented programming implementation allowing you to define, for example, method-interceptors and pointcuts to cleanly decouple code implementing functionality that should logically speaking be separated. Using source-level metadata functionality you can also incorporate all kinds of behavioral information into your code, in a manner similar to that of .NET attributes. Spring's Web package provides basic web-oriented integration features, such as multipart file-upload functionality, the initialization of the IoC container using servlet listeners and a web-oriented application context. When using Spring together with WebWork or Struts, this is the package to integrate with. Spring's MVC package provides a Model-View-Controller (MVC)	implementation for web-applications. Spring's MVC framework is not just any old implementation; it provides a clean separation between domain model code and web forms, and allows you to use all the other features of the Spring Framework. With the building blocks described above you can use Spring in all sorts of scenarios, from applets up to fully-fledged enterprise applications using Spring's transaction management functionality and web framework integration. By using Spring's declarative transaction management features the web application is fully transactional, just as it would be when using container managed transactions as provided by Enterprise JavaBeans. All your custom business logic can be implemented using simple POJOs, managed by Spring's IoC container. Additional services include support for sending email, and	validation that is independent of the web layer enabling you to choose where to execute validation rules. Spring's ORM support is integrated with JPA, Hibernate, JDO and iBatis; for example, when using Hibernate, you can continue to use your existing mapping files and standard Hibernate SessionFactory configuration. Form controllers seamlessly integrate the web-layer with the domain model, removing the need for ActionForms or other classes that transform HTTP parameters to values for your domain model. Sometimes the current circumstances do not allow you to completely switch to a different framework. The Spring Framework does not force you to use everything within it; it is not an all-or-nothing solution. Existing front-ends built using WebWork, Struts, Tapestry, or other UI frameworks can be integrated perfectly well with a Spring-based middle-tier, allowing you to use the transaction features that Spring offers. The only thing you need to do is wire up your business logic using an ApplicationContext and integrate your web layer using a WebApplicationContext. When you need to access existing code via web services, you can use Spring's Hessian-, Burlap-, Rmi- or JaxRpcProxyFactory classes. Enabling remote access to existing applications suddenly is not that hard anymore. The Spring Framework also provides an access- and abstraction- layer for Enterprise JavaBeans, enabling you to reuse your existing POJOs and wrap them in Stateless Session Beans, for use in scalable, failsafe web applications that might need declarative security. Preface Sponsored by Interface21 Chapter 2. What's new in Spring 2.0?